The Super Bowl is right around the corner and as most NFL fans know, on February 3rd, two of the biggest teams in professional football will be taking the field to prove who really is the best team in professional football. While we still don’t know who will be facing off in the Super Bowl this year, we do know that as always, the Super Bowl promises to be one of the most entertaining live television events of the year. This is why, no matter who you are cheering for, or whether or not your team is still in contention, you need to have the right place to view the Super Bowl. While you could slave over Buffalo Chicken Dip and Crock Pot Meat Balls all afternoon while attempting to host your own party, that really isn’t all that fun. So instead, let Hearthstone take care of all of the work and come join us for one of the biggest Super Bowl parties in Las Vegas. Our Super Bowl event starts at 2:30 PM, way before kick off time so you can come, settle in and enjoy some food and drink before all of the action starts to unfold. We will be running several specials throughout the day, including $6 Bud Light drafts and $24 pitchers. We will also have plenty of food specials as well. This includes a $50 all-you-can-eat menu featuring live stations. These live stations will include: a whole pig, pulled pork sliders, pizza, tacos and salads. This is why it is so important to get there early so you can take advantage of a whole afternoon and evening of food specials. Of course, we will also be playing the big game across all of our flat-screen televisions here at Hearthstone, and trust us, there is no bad seat in the house. This way you don’t have to worry about missing a single live performance, a single play or a single commercial. 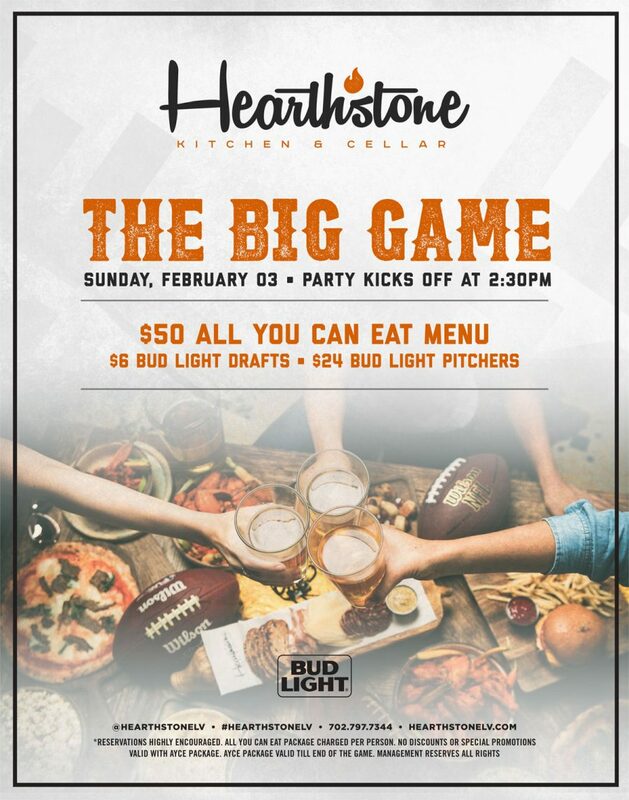 In order to take advantage of all of these great food and drink specials, you need to get down to Hearthstone on Super Bowl Sunday—February 3rd at 2:30 PM. Trust us, this is one Super Bowl part you won’t want to miss so make your reservations!